This morning as I rinsed my coffee cup I spied Victoria’s calendar on the kitchen counter. An odd place for it, to be sure, so I looked closely to see if it was a current calendar. Indeed it is – turned appropriately to the month of May. May 6: Field Day. Yep, it was. Despite how she previously told me she hated Field Day, I was there to witness her having a darn good time. May 7: Drew’s Birthday. Drew is her favorite male classmate. She has another word for him – something that eludes to him being a boy who is a friend, but I just can’t go there with my 9-year old baby quite yet. I get queasy just thinking about it. They held hands at Field Day. I had to sit down. May 8: MaMa and Sissy – the kids and I travelled to Tyler with my parents to surprise my grandmother (MaMa) for Mothers’ Day. So proud that she documented the trip. May 10: Today. I have no idea why the entire day is blocked out. Perhaps I should have asked her about that before the day got started…it looks ominous. Anyhoo, I figure she probably wrote something in error and this was the only way to never have to think about it again. Bright pink certainly draws your attention away from it, no?? May 23: Victoria Day is celebrated in Canada. Vic insists that our family should certainly celebrate it as well. “Yay Yay” is written on the date. All Hail, Queen Victoria. May 30: Memorial Day, already assumed to be celebrated at Aunt Pam’s house (and more importantly, Aunt Pam’s pool) just like the past five Memorial Days. I have told Victoria that we must receive an invitation first. Vic apparently has every confidence that the invite will be forthcoming. 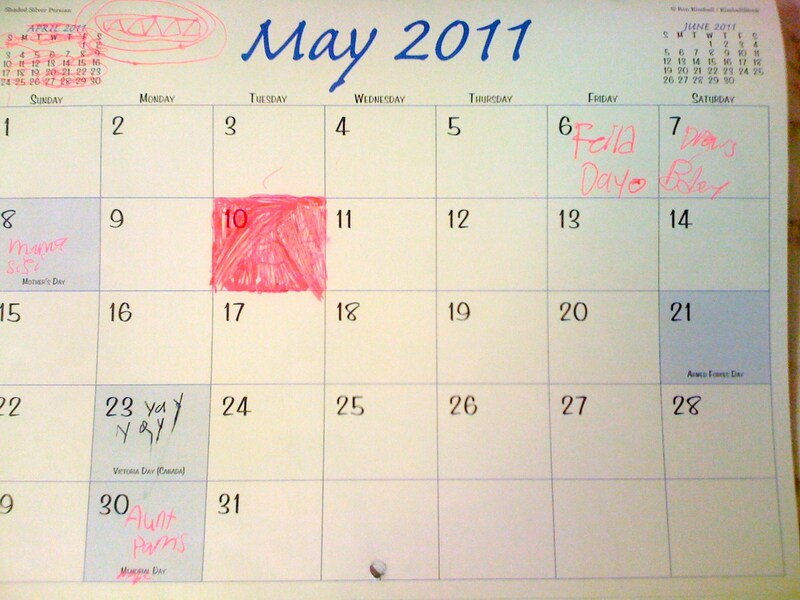 I am surprised that the Last Day of School has not earned its rightful spot on her calendar. Perhaps she wanted to be certain of the date first, so she doesn’t end up with two pinked-out squares. FYI: the last day is the 31st, a lone Tuesday after a three-day weekend that counts as a legitimate attendance day – a matter that leaves me more confused than why Vic’s calendar was on the kitchen counter in the first place. This is so cute. And a hand-holding boy already? Oh goodness! They grow up too fast. No lie, Jess. Brace yourself!